When Amos Taylor steals a parson’s clothes, he thinks he’s found the ideal disguise to hide his life of crime—until an old blind man enters his life who has a little trick up his own sleeve. Before long the disguise is working too well: The local residents start expecting Amos to actually serve as their preacher! 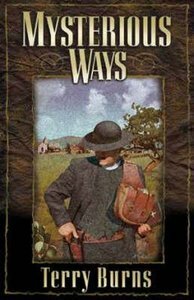 When revival breaks out in the small Texas town, Amos’ payoff is bigger than he could have dared imagine—proving, indeed, that the Lord works in Mysterious Ways. Terry Burns has crafted a novel of uncommon power and force, revealing both sin and redemption, while lifting the reader to a higher plane where faith and prayer play a strong role in the lives of men and women as God reveals his hand through an unlikely source, the criminal Amos. There is inspiration in these pages. About "Mysterious Ways (Mysterious Ways Series)"